Spray Adhesive can use when a long-lasting bond is needed. High tack, high coverage and fast drying for permanently attaching foils, carpeting, lightweight paper, cardboard, felt, and cloth to painted or unpainted metals or wood. 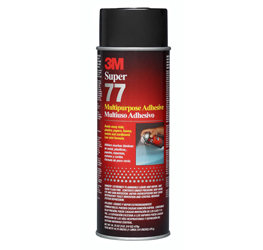 530-4-77 - 3M Super 77 Multipurpose Spray Adhesive - 24 oz. 3M super 77 multipurpose spray adhesive - 24 oz. you can use when a long-lasting bond is needed. High tack, high coverage and fast drying for permanently attaching foils, carpeting, lightweight paper, cardboard, felt, and cloth to painted or unpainted metals or wood.